Aachen (Aix-la-Chapelle) has a lovely historic old town that provides the perfect backdrop to the German Christmas market (Weihnachtsmarkt) closest to Britain, Belgium, and the Netherlands. Aachen (Aix-la-Chapelle) in Germany has a lively Christmas market (Aachener Weihnachtsmarkt) that is popular with German and foreign visitors. Aachen is the westernmost city in Germany and located near the border with Belgium and the Netherlands. It is thus also very popular with British travelers who prefer to travel by train or road rather than flying to German Christmas markets. By train, Aachen is a short ride from Brussels, with easy connections from the Eurostar, or around three hours drive from most ferry ports. Visitors to Aachen can also enjoy sights related to Charlemagne, fine art, and the very relaxing Carolus Therme hot water day spa. Aachen’s main Christmas market is concentrated on the large public squares around the cathedral (Dom) and Rathaus in the old town area. The cathedral, which combines styles from the Carolingian era to the present, is the perfect background to the market and particularly romantic when covered in snow. Around 120 stalls sell Christmas related wares ranging from freshly baked waffles to leather ware and wooden toys at the main market. Two further smaller Advent Markets are held nearby at Holzgraben (20 stands) and Kugelbrunnen (five food stands and a carousel / merry-go-round for children). As with other Christmas markets in Germany, the emphasis is on traditional Christmas decorations, wooden toys, and handmade items. Mass-produced plastic items and low-quality clothes are generally not sold at German Christmas markets – prices are therefore not that cheap but quality and workmanship high. Food and drink are integral parts of German Christmas markets. Grilled sausages, potato cakes, waffles, and pancakes are standards but every city or town will sell its own specialties and traditional cakes too. The local specialty is the Aachener Printen (Biscuits d’Aix) – a type of Lebkuchen with Christmas spices. Glühwein (hot mulled wine) is the drink of choice at German Christmas markets but non-alcoholic drinks are of course always available too. Kinderpunch is warm fruit juice (usually with light spices) for children and non-drinkers while hot chocolate is always popular too. The Christmas market in Aachen has relatively long opening hours and a long opening period. It usually starts a few days before Advent and closes shortly before Christmas Eve. 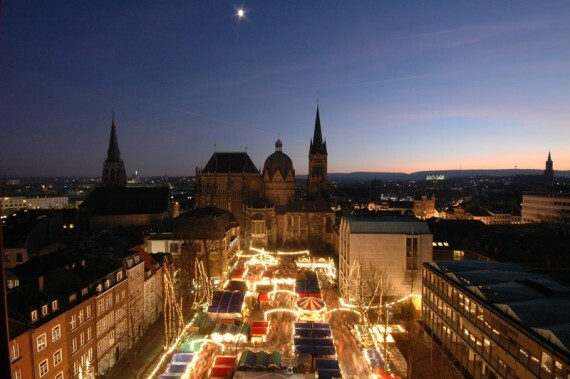 The Christmas Market in Aachen operates daily from late November to December 23 from 11 am to 9 pm. Admission is free. Aachen has a long history and many sights worth seeing. The city is closely associated with Charlemagne (Karl der Große) and the first emperors of the Holy Roman Empire (of the German Nation). The Aachen cathedral (Dom) is where German kings were crowned from 936 to 1531 (thereafter in Frankfurt am Main). The core of the cathedral is still the octagon built by Charlemagne while his gilt shrine and throne are some of the top sights to see in the cathedral, which combines styles from many different periods. Opening hours are usually 7 am to 7 pm, opening only after services on weekend mornings. Aachen has a surprisingly large number and wide variety of museums and art galleries. The Middle Ages are of course represented but Aachen also has splendid galleries with modern art, old masters, and applied arts. The hot water springs in Aachen were popular with the Romans and may well have motivated Charlemagne to built one of his most important palaces in Aix-la-Chapelle. The historic spa buildings were destroyed during the Second World War but the modern facilities of the Carolus Therme are just as welcoming to all visitors over six years. Visitors can simply relax in the hot water baths and saunas or book special day-spa treatments, facials, massages, or water cures. 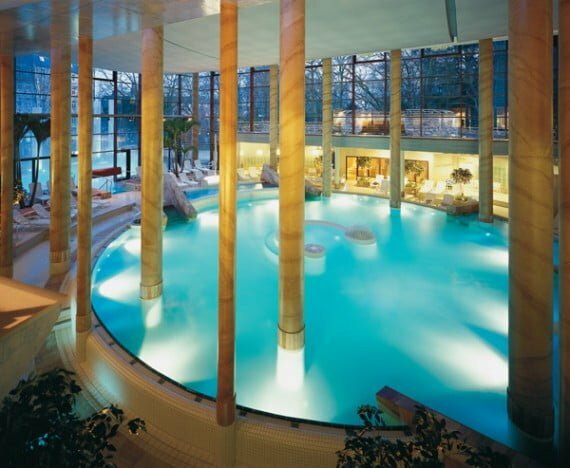 The Carolus Therme hot springs spa is open daily from 9 am to 11 pm. The spa is even open over the Christmas and New Years Day holidays although with shorter hours. If traveling by bus, ask for the “Ticket to Wellness”, which gives discounts on admission and travel. For more details also see Relax in the Carolus Therme Day Spa in Aachen. Getting to Aachen is easy by car, bus, or train. Aachen is halfway between Brussels and Cologne (Köln) near the Dutch city Maastricht. The closest airport to Aachen is Maastricht-Aachen (MST) in the Netherlands (40 km) but Cologne-Bonn and Düsseldorf (both around 90 km away) have far more flights. Aachen can easily be reached by train – high-speed Thalys trains from Paris via Brussels to Cologne stop in Aachen while the German Inter-City-Express (ICE) trains from Frankfurt am Main via Cologne to Brussels also call here. Further trains are available from Brussels and Cologne. Traveling times by train is around 36 minutes (ICE/Thalys) and 54 minutes on regional trains from Cologne and just over an hour on the fast trains from Brussels. Deutsche Bahn (German Railways) has an excellent online timetable for almost all public transportation options in Germany and the rest of Europe. Travel times from London can be as fast as four hours by Eurostar trains or 11 hours by bus – Trainline provides quotes for both train and bus options. See also Travel by Bus, Train, or Coach from the UK to Aachen for more details on transportation options from Britain.